Why Did Equity Mutual Fund Inflows Fall By 33% In November? Jason Monteiro December 10, 2018 December 10, 2018 No Comments on Why Did Equity Mutual Fund Inflows Fall By 33% In November? After enjoying a steady rise in inflows over the past couple of months, the net inflows into Equity Mutual Funds dropped 33% to Rs 8,414 crore for November 2018, from Rs 12,622 crore in October 2018—an 8-month high. Inflows in the past few months have been extremely volatile, and are now back to a level touched in August 2018. What is more concerning is that the gross sales of equity funds fell Rs 9,352 crore or 32% MoM to Rs 15,614 crore in November 2018, from Rs 24,966 crore in October 2018. This is the lowest sales number reported since January 2017. Redemptions too, eased by Rs 2,983 crore or 29% MoM to Rs 7,200 crore in November 2018 from Rs 10,183 crore in October 2018. Weak Market sentiment or Reduced Incentive to sell? What was the reason behind the sharp fall in Equity MF sales? The current fall in inflows could be owing to multiple factors and the primary data is not conclusive to pin-point just one. The volatile markets over the past few months and the negative returns on one-year SIPs in equity mutual funds may have reduced investor appetite for equity. However, the data is not conclusive, as SIP inflows have remained strong at around Rs 8,000 crore. SEBI’s ban on upfront commissions could be a key reason behind the fall in sales. The era of upfront commissions was brought to an end by SEBI last month. Earlier, AMCs paid an upfront commission of upto 1% for open-ended equity schemes. They also upfronted the trail commission of close-ended equity schemes, resulting in a total incentive of nearly 6% for close-ended funds. Thus, there was a flourish of close-ended funds in the past couple of years. This reduced incentive to sell may translate into lower inflows for equity funds in the coming months. This combined with weak market sentiment, does not bode well for inflows into equity funds. 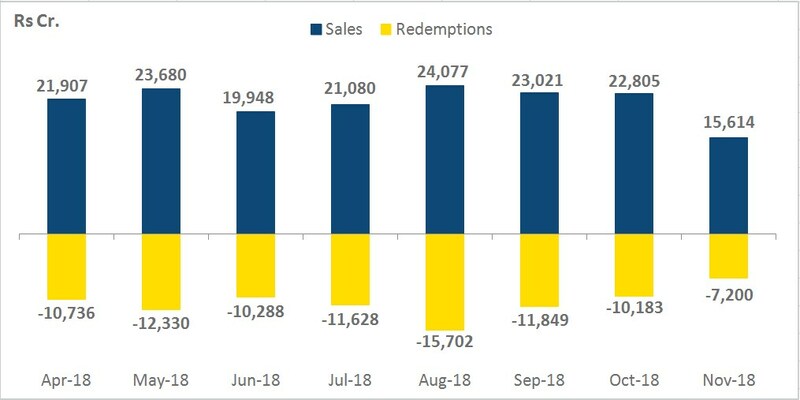 Between August-October 2018, redemptions reduced over the period to Rs 10,183 crore from Rs 15,702 crore. Redemptions eased significantly in November 2018 to around Rs 7,200 crore. Strong equity MF inflows have buoyed the market over the past few years. In the past 12 months, Foreign Institutional Investors sold as much as Rs 30,000 crore. However, mutual funds were net buyers on the stock exchanges, investing as much as Rs 1.18 lakh crore in Indian stocks. Over this period, over Rs 1.35 lakh crore was invested into equity mutual funds. Fund flows are also an important indicator of investor sentiment. Reduced inflows signal a weak market sentiment. However, the current fall in inflows may be a temporary blip. The trend in equity inflows over the next few months will be a key indicator, and will set the tone of the market. NSE Nifty : Limited Downsides!